I dropped my turkey sandwich and ran out of the room. I had to meet the driver. We don’t get a steady stream of EV owners using our Level 2 public charging station, so when we do, I want to hear their stories. Bill and Jim Brooks, brothers and owners of Fargo Pinball (awesome, right? ), were in the front lobby waiting for their 2015 Tesla Model S to charge up enough for the drive home. Bill, the car’s owner, happily answered all of the questions Ben and I threw at him about the Tesla line of electric vehicles, which are well known for their sleek design, enormous touchscreen navigation and incredible acceleration capabilities. 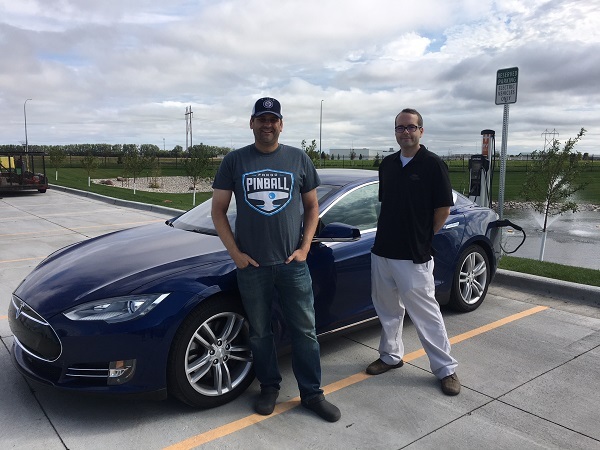 Bill told us about the community of Tesla owners in North Dakota, which is currently small, but growing all the time as new models are released. 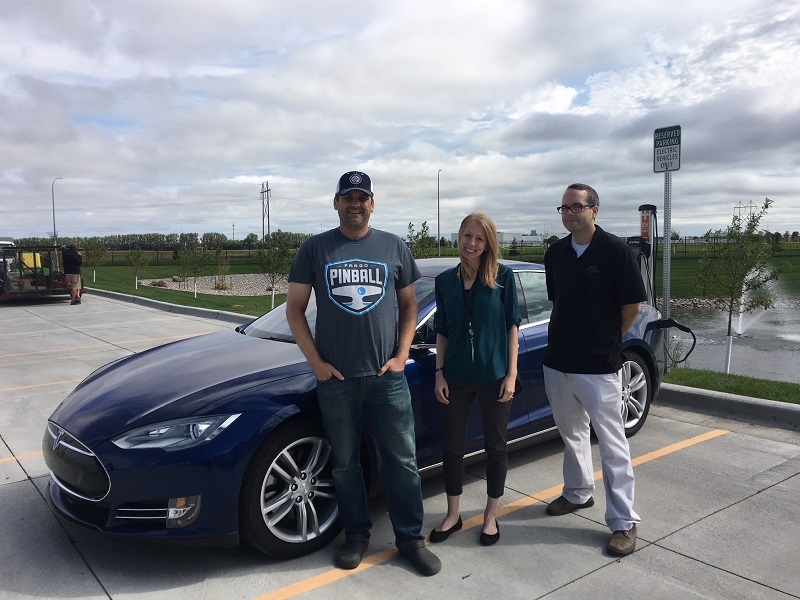 He's also active in communicating with legislators about ways in which North Dakota can better support the growth of electric vehicles. Tesla drivers are like celebrities to me. I had to get a photo with Bill (left) and Jim Brooks (right) before they unplugged for the trip back home. After sitting in the car and interrogating Bill a little more, we snapped some photos and let the brothers continue their journey to Fargo. I had a journey of my own to prepare for today – to Wild Rice Electric Cooperative in Mahnomen, Minn. The trip would take me 90 miles to the co-op’s evening Member Advisory Committee meeting, comprised of Wild Rice Electric member-consumers who use their voice to help guide co-op decisions. I was asked to bring the Bolt to the meeting to show the committee the benefits and blossoming opportunities of electric vehicles. And of course, to offer a few test drives. That’s the best part! The Minnkota EV parked outside sparked some questions before the meeting, but after a delicious group dinner, some cooperative updates and discussion, and then an EV 101 presentation by yours truly, this group of men and women from the rural reaches of the Wild Rice service area had even more inquiries. How fast can it go? Where could I charge around here? Is that going to clear an unplowed gravel road in the winter? The questions flooded out – and a couple of committee members decided to take me up on the offer of a sundown spin around the block. By night’s end, I know I had at least two or three people seriously considering an electric vehicle. I caught a lot of Wild Rice Electric members as they walked into their monthly meeting and got the questions flowing early. They were such a curious and engaged group! It wasn’t hard to talk these folks into sticking around after the meeting for some test drives. I don’t think they were expecting such a small, gas-free car to pack such a punch. “They’re definitely the cars of the future,” mused Lisa Guenther, having watched her husband Dan arrive back from a test drive. They certainly are, Lisa. And the future is now.